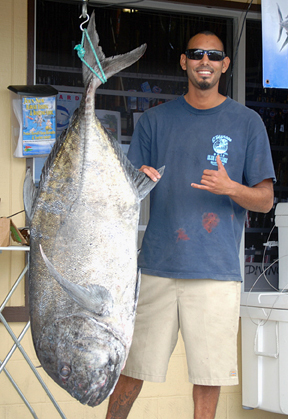 Chris Alvarez put his second ulua in the elite 100 Plus Club in April of 2011. He was fishing in the Kalapana region of the Big Island using a 13-foot Slider pole, Newell 550 reel and 80-lb test when he hooked his 104.1-lb monster. The Suffix line held up to the strain and soon Chris was arriving at S. Tokunaga Store with his prize catch for an official weight. And that, as we already know, was good news!